iOS 11 was introduced during Apple's Worldwide Developers Conference on June 5, 2017 and was released to the public on September 19, 2017 and is the current version of iOS. 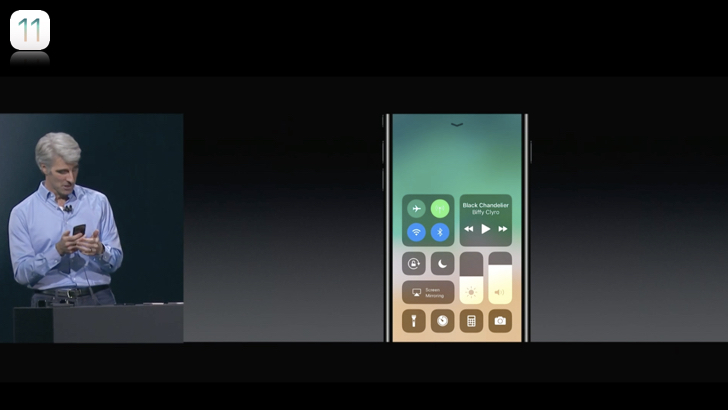 Control Center redesign bringing all controls together on one page plus gains support for 3D Touch, while the Lock screen and Notification Center are combined. While iOS 11 introduces a completely redesigned App Store while support for Augmented Reality apps is provided through ARKIt. Apple Pay Cash introduced in the US. Alongside the new iPhone 8, 8 Plus and X Apple introduced Studio Lighting into the Camera app. Later releases introduced support for the Apple HomePod and the iPhone Battery Health (beta) feature. Later iOS 11 beta's have introduced AirPlay 2, Apple's next-generation robust multi-room device streaming protocol. Also supporting the Apple HomePod while providing HomePod stereo pairing functionality. Read our AirPlay 2 first impressions here. • Apple Podcasts has an all-new design. Use Listen Now to easily play new episodes or continue where you left off. Shows can now also contain seasons, trailers and bonus episodes. iOS 11.1 introduces over 70 new emoji and includes bug fixes and improvements. iOS 11.2 introduces Apple Pay Cash to send, request, and receive money from friends and family with Apple Pay. This update also includes bug fixes and improvements. iOS 11.3 introduces new features including ARKit 1.5 with support for more immersive augmented reality experiences, iPhone Battery Health (Beta), new Animoji for iPhone X users, and more. This update also includes stability improvements and bug fixes.